Marantz ES7001 review | What Hi-Fi? We're well aware that many buyers attracted to the notion of better sound are put off by the room-dominating impact a proper 5.1 speaker set-up can have. 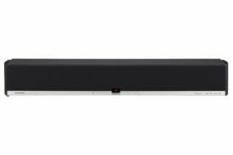 Marantz's ES7001 sound bar – also called the Cinemarium – is one attempt to solve that quandary. So what's a sound bar? In basic terms, it's simply a horizontal, self-powered loudspeaker designed to upgrade the limited designs often fitted as standard to modern TVs. However, the Marantz's power, specification and capability put it into a different league from any previous contender. It's designed as a premium accompaniment to high-end TVs. The ES7001's surround effect relies on Marantz's Optimal Source Distribution technology – OPSODIS – which unlike most rivals, doesn't attempt to bounce sounds off walls. Of course, there's little point in it being easy to install if it doesn't deliver sonically, but Marantz is so confident about the ES7001's sonic abilities that unlike almost any other sound bar we've tested, it doesn't come with a subwoofer as standard: there's an output to drive one, of course, but it's an optional extra. But y'know what? We can see many listeners being perfectly happy with the Marantz just as it is. It's terrifically full-sounding and powerful by the standards of its class, offering weight and drive with big action movies, coupled to impressive depth, scale and 'spread' to the sound. And amazingly, it's even musical: a spin of Jamiroquai's Love Foolosophy shows the Marantz can track a complex bassline like a hi-fi pro. For us, given the nature of this product and its overall sonic prowess, that'll probably do. No doubt about it, it's the finest sound bar we've tested yet. And it's now even better value. Marantz has just reduced its price by £100, from the £900 of the original review, and we've seen it for even less. And that's just enough to tip the balance and win it the fifth star.